A hot and tasty way for preserving Aubergines over the winter months. Delicious with cheese. Warning – this is HOT!!!! This chutney, kept in properly sterilized and sealed jars, should keep for a year in a cool dark place. Once opened, keep in the fridge and try to use within 4 weeks. I have used Balsamic vinegar instead of the normal vinegar, used less chili’s, so it became more an aubergine chutney, that is sweet and has a beautiful dark purple to black colour. Sounds nice. John likes it hot though and we’ve an awful lot of chillies! 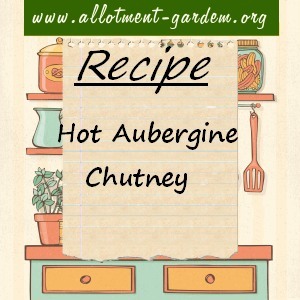 Absolutely delicious chutney, I used 3 large chillies and it isn’t too hot for me at all. First ever attempt at a chutney and it’s a great success, thanks for the recipe! If it was me, I’d leave it for at least 3 months in order for it to mature. Thanks for your reply – we ate some straight away because it was so delicious and we couldn’t resist it but we will leave the rest to mature for a while. Yum! Fantastic recipe. I tasted it as I put into the jars and it was deliciously hot. I am looking forward to trying it in a few months when it has matured. The onions should be soft by the time that you’ve simmered it until it’s thick. Thanks for this excellent recipe – it tastes great but very salty – not sure if it’s something I’ve done wrong altho I followed the recipe to the letter – is there anyway to remedy this? Not really. Perhaps you didn’t thoroughly rinse the aubergines? 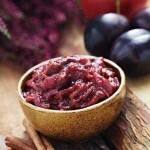 It may subside with time – chutneys do need at least a couple of months to mature. PS. would be good if you could give me some idea of shelf life. Most chutney will keep in a cook dark place for a year or more so I suppose this is similar. The official line is 12 months but, to be honest, as long as you’ve sterilized etc. it lasts much longer. 3 or 4 years is not unusual. We always leave chutneys for at least 2 months (usually 3) to allow them to mature before opening. I am interested in making aubergine and mango chutney but i am unable to find a recipe. 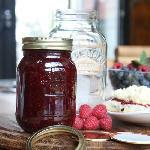 I have tasted a shop bought version of this chutney and would like to try to make it, is any one able to help me please? Thank you for this wonderful recipe. I didn’t change anything and the chilli content was perfect for us. I will make this again as a way of using up aubergines, as husband is tired of aubergine curry! 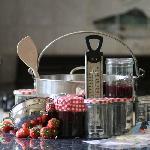 A real chutney should contain large identifiable pieces of the fruit or vegetable it’s made from – it’s only the mass produced versions that end up as gloopy jams. Yum yum, my all-time favourite chutney for Indian food, and cold hams! :O) And the only way I can handle aubergines. YES!!! Balsamic Vinegar works most well. I have “Tweeked ” recipe a little more. Using red onions, Dark Muscavado Sugar and adding (to taste) small quantity of ground Cinnamon. The Young Chutney is deep purple, smells and tastes most fantastic!! ref=”#comment-3708″>Anne: I have just made this recipe using my late season aubergines that were refusing to ripen and it is fine. I Think the longer you leave the aubergine in salt will remove any chance of a bitter taste.